Yesterday famous Free Software movement launcher Richard Stallman visited our school HAAGA-HELIA University of Applied Sciences and gave two speeches about Trends in Programming. 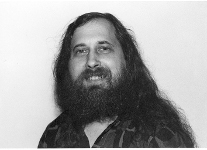 Stallman started the development of GNU operating system in 1984 which lead to the release of most used operating system on server side technology nowadays most often referred as Linux. Despite the fact that mr. Stallman in his speech made sure everybody now knows who really did all the hard work and why the operating system should be known as GNU/Linux or GNU+Linux. The first speech was more about the history of GNU operating system and why every human soul should respect the original values of the project. The speech started explaining what Free Software movement is and how it is used. It was very good knowledge and I think many in the audience agreed with the theories and gave some support for them. He also explained with examples why free software should be all around us. For example if I heard corrent Richard Stallman does not have a portable telephone because that machine can be traced and is not open. When the speech went on, it came more and more clear that Richard had been offended in alot of ways by alot of people breaking the original idea behind GNU operating system. I think in the speech he said some bad things first about Microsoft, Apple, Google, Amazon and after all this he started the usual rant against Linus Torvalds who is the number one devil ruining GNU. At the end of his speech he wore a cloak and a hat and blessed the audience with the style of church Emacs. That was kinda funny and everybody laughed alot so it ended well! On the second speech Richard Stallman talked a little bit the same of GNU and trash talk about certain big companies. But he also made some comments about programming. He talked about some really good tricks in debugging and how you should use break points to narrow down the error in the software. He also gave some good tips if you’d like to join the free software movement and help it’s cause by doing some actual coding. On his second speech he gave alot of time for questions from the audience and one man made a huge mistake by trying to overtalk him in free software arguments. You should know better. His speeches had some truly amazing points about free software and how world should be. But I think they are alot drawn away from reality. But after all it is a movement which tries to get things better in a long run which he reminded us that real software development has existed only 20-30 years. I personally didn’t like his trash talk about big companies and mr. Torvalds but maybe someone has to say these things out loud. He is a great public speaker and has very important things to say but maybe some things could be said in another way. But anyway, he gave two great speeches about his work in the development of GNU/Linux and you should respect atleat some of his views if you use something which have risen from his GNU operating system project. Thanks mr. Stallman!